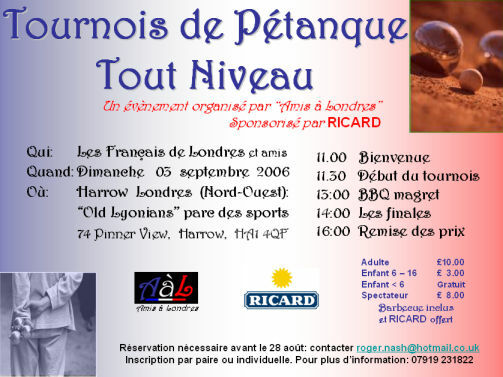 Event: Tournois de Petanque and BBQ. The 03 September will see the first event organised by Amis a Londres. A Petanque Tournament for all levels has been arranged at the Harrow Petanque Club in North West London. It should be a great day, top value for kids with a quality BBQ and well run competition. A great environment for the French and francofiles in London to mix and meet. The word is spreading rapidly among the French in London and due to popular demand you must register prior to the event as you may not be able to just turn up and play. Kind sponsors RICARD will be ensuring that the adult competitors are topped up with the finest Pastis to help keep all in good spirits. And the Harrow Petanque Club are throwing open their club facilities and will manage the competition. Amis a Londres was originated as a fun way to help non-French meet the French in London and vice versa. It creates natural opportunities to speak and improve French language skills and for all to meet new friends and contacts in London. The petanque event is the first of many others arranged for the future including a “Jeu De Tarot” competition scheduled for November. All events are with fun at the top of the agenda and celebrating the best of France whether you are really French, or whether you just wish you were from time to time.